^ Pedhazur, Elazar J.; Schmelkin, Liora Pedhazur. Measurement, Design, and Analysis: An Integrated Approach 1st. Hillsdale, NJ: Lawrence Erlbaum Associates. 1991: 15–29. ISBN 0-8058-1063-3. ^ International Vocabulary of Metrology – Basic and General Concepts and Associated Terms (VIM) (PDF) 3rd. International Bureau of Weights and Measures. 2008: 16. ^ 17th General Conference on Weights and Measures (1983), Resolution 1.. [2012-09-19]. ^ Naughtin, Pat. What is metrication (PDF). Pat Naugthin: 4, 5. 2007 [2013-06-13]. ^ 8.0 8.1 Michell, J. (1999). 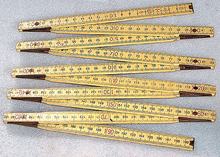 Measurement in psychology: a critical history of a methodological concept. New York: Cambridge University Press.